The complications which can arise when there is a sodium hypochlorite spill when carrying out a root canal treatment. Sodium hypochlorite is a bleaching agent which is a commonly used irrigant which is used when carrying out a root canal treatment. Complications can arise when a sodium hypochlorite spill or leakage occurs through the negligence of a dental practitioner. Sodium hypochlorite is used to clean the clean the canals and pulp chamber of a tooth to dissolve the bacteria and acts as an effective antimicrobial agent. The use of sodium hypochlorite necessitates caution and careful handling. As it is a bleaching agent there can be severe consequences if it comes into direct contact with a patient. • A dentist may apply too much pressure to the syringe and the sodium hypochlorite is extruded beyond the root canal. • This may also occur if the dentist has miscalculated the angle of the canal and the solution is then forced out and a spill occurs. • The dentist may inject the solution too rapidly and a spill then occurs. • Sodium hypochlorite can also be forced out of a tooth into surrounding tissue if the dentist has perforated the root or there is a crack in the tooth which has not been noticed by the dentist. • A dentist may also fail to adequately protect a patient by failing to use a rubber dam to prevent the sodium hypochlorite going down a patient’s throat or failing to protect the patient’s eyes and clothing in case a sodium hypochlorite spill occurs to minimise the damage to the patient. As Dental Negligence Lawyers, we see many cases where a dentist has caused a sodium hypochlorite spill and this has resulted in a client experiencing unnecessary pain and suffering. The Dental Negligence Team acted for a female client and succeeded in obtaining her compensation when a sodium hypochlorite spill occurred. Our client underwent root canal treatment with her dentist; during the treatment the dentist spilt the sodium hypochlorite into the tissues surrounding the work site. This caused our client to suffer excruciating pain and her face began to swell. As a result of the sodium hypochlorite spill, the woman had to stay in hospital for 24 hours and was given intravenous medication. 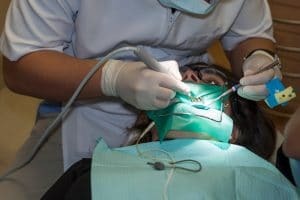 If you or a member of your family have suffered complications of root canal treatment due to a sodium hypochlorite spill and have suffered damage as a result, please contact the Dental Negligence Team, who would be happy to assist with your enquiry. I’ve recently had a root canal and the dentist used sodium hypochlorite to clean the root and it spilled to my upper gum and caused unbelievable burning he had to stop and rebook my app , my nose has brown water pouring out my eye keeps watering and my teeth don’t feel like mine . Thank you for your comment. Should you wish to discuss your enquiry further. please email me your contact details. My email address is sophia.courtaux@roydswithyking.com. Hi 2 weeks ago my jaw was accidentally injected with sodium hypochlorite. I am still in too much pain to eat or talk properly from damage to my lips and gums . Consultant said it could be weeks before there is any improvement. Hi Karen. I am so sorry to hear that you are experiencing so much pain. This sounds like something we could look into further for you. If you would like to discuss this with us, please give me a call on 01225 730 218. Kind regards, Yasmine. I am sorry to hear that you’ve been through such an ordeal. Please do contact a member of our team to discuss this further.